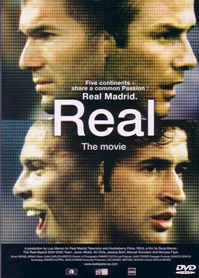 Real, The Movie is the first official movie about Spanish soccer club Real Madrid. Produced by the same club and directed by film director Borja Manso, the movie premiered in the club's stadium Santiago Bernabeu on August 25, 2005. A mix of documentary and drama, Real. The Movie tells the history of the club and the story of its fans around the world. The movie stars David Beckham, Raul, Zinedine Zidane, Ronaldo and many other present and former figures from the Spanish Club. With the 2006 World Cup just round the corner, this disc might come at the right time for fans of Real Madrid. Touted as the official movie of the renowned Spanish club, this mixed bag of drama and documentary might not go down as well as expected though. The movie opens with a history teacher who has just been posted to a school in Spain. Through the eyes of this non-football fan, the audience is introduced to how passionate the Spanish is to football. Now if the storyline has stayed this way, this will be a very interesting insight to Real Madrid and how footballs affect Spain socially and economically. Instead the filmmakers decide to diverge into several storylines simultaneously, there’s a Beckham-obsessed student in Japan, a young college female student struggling to live her dreams as a footballer despite her injuries in New York and a poor village boy smitten with nothing else except football. All these subplots if presented individually would have made an interesting watch. But to share the running time with the documentary portion takes the audience’s connection out of it. There’s some must-watch behind the scenes which show the coaches’ planning their strategies, snippets from Real Madrid past matches and the frenzy behind the start of every match. Other than that, the “Stars” of the movie, David Beckham, Raul, Ronaldo and Zidane are given almost fleeting shots. Do not expect in-depth interviews or juicy tabloid stuff. Nope, there’s no coverage of post-matches’ parties as well. However, you do get scenes of the team players training hard on the field. Given the rich history of the club, it's another added pity that the historical background is lightly delved into. The only consolation is the interviews conducted with some of the Club's former great footballers. It might be a tad too hard to juggle and balance between drama and documentary. Things would be much more captivating if the filmmakers have opt for either one. It’s time to go back to the strategy table if there’s a sequel. This Code 3 DVD does not contain any special features. There's no indication of the audio technical aspects but on the whole, the recording is satisfactory for the most parts. Visually, the colour transfer is rich and vibrant. Stunning is the word for some of the sequences shot.